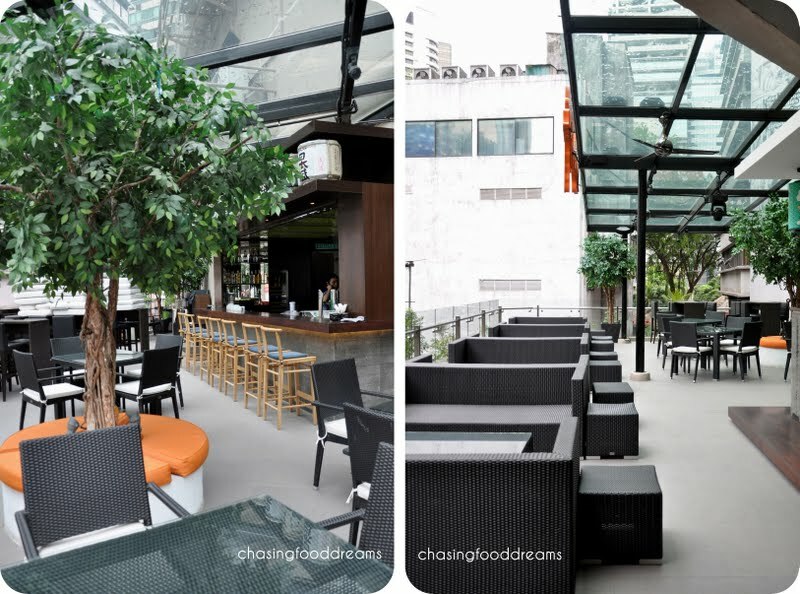 Doraku, Life Center Kuala Lumpur: Japanese Cuisine with a Latin & Asian Twist! Not Your Typical Japanese Restaurant! It started in Miami, followed by Honolulu, Doraku is now set to put a new trend in Japanese dining here in Malaysia. A first out of its origin in the United States, Doraku was the brainchild of Kevin Aoki, son of Rocky Aoki from the famous Benihana Group. Trending the contemporary gastronomic journey, Doraku’s mix of Japanese cuisine with Latin and Asian inspiration brings something extraordinary to the modern palate of today’s cuisine. Brought into Malaysia by Hafez M. Hashim of the HMH Group, the chic and trendy Doraku, located at Life Center Kuala Lumpur, is the epitome of today’s modern cuisine. It’s certainly different! Stepping in, Doraku evoked a trendy and funky ambience with a chic touch. 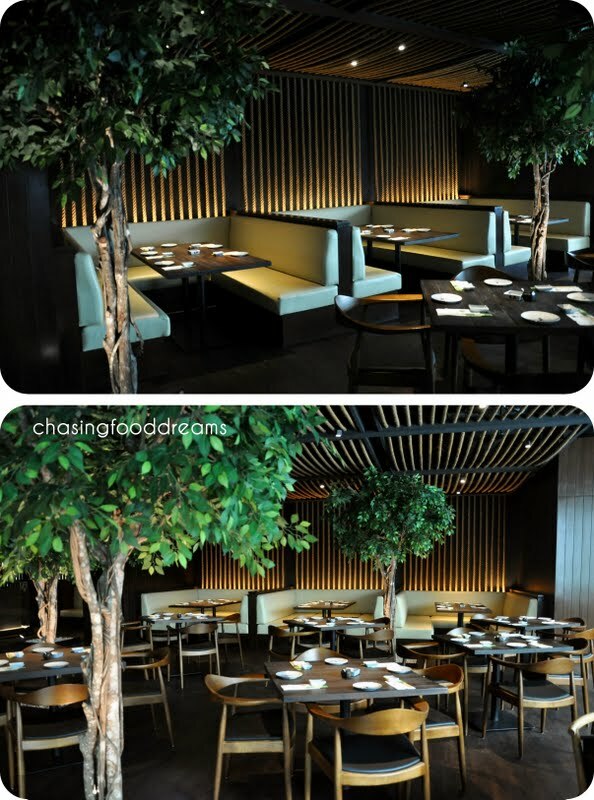 Dressed with dark and light wood with cream, trees and plenty of natural elements and lights, the restaurant is spacious and pleasant. Choose from air conditioned seats to the outside al fresco lanai as you wish. There is also the sushi bar for some live kitchen action if it tickles your fancy. Helmed by Executive Chef Yutaro Tsuchiya, guests are in for a treat at Doraku. Armed with 17 years of culinary experience and skill in various Japanese restaurants, starting from Yokohama in Japan before moving to US to be the head sushi chef at the renowned Benihana in Dallas, Chef Yutaro also mentored under the infamous Iron Chef Hiroyuki Sakai. With an A-list celebrity guests in his dining list, Chef Yutaro is in great demand for his unique and trendy creations. Here’s a chef that takes Japanese into the modern culinary world! When the sun goes down, the city comes alive. Joining the city, diners can groove to the beat from the house resident DJ while enjoying the long list of sakes, alchohols, wines, beers and cocktails at Doraku! They take their drinks seriously and we did sample some gorgeous cocktails as living proof. It’s simply fantabulous! Ume Margarita hits all the right notes in flavor at first sip. An Asian inspired concoction of Sauza Gold, fresh lime, Japanese Ume and plum liquer, this cocktail is beautifully refreshing on the eye and taste. A bright yellow color, the flavors of the salty sour plum strike all the happy notes in my senses. Thoroughly addictive, I cannot help but raved at this gorgeous margarita! It’s just peachy! Peach Martini is fruity and sweet, something ladies would like. Carpaccio may have started from the Italians but here it takes on a new touch of Japanese. Thinly sliced salmon is fanned out on a pool of creamy ginger sauce with dollops of creamy sauce and tobiko. The omega rich fish is heightened by the tangy gingery sauce in great doses. A bite of this will ignite your neurons of sour and sweet with ginger flavors. The buttery white tuna is lightly marinated in ponzu sauce. Sweet miso is topped on the fish and lightly torched while chili oil is drizzled on for a spicy finish. Lightly firm, the Peruvian inspired fish is sweet and citrusy while the miso provided a creamy and salty edge. For those who fear raw fish, this one might just cure it for you as the fish is literally cooked in the citrus sauce and also from the light torching. Poke, pronounced as poʊˈkeɪ, is a Hawaiian dish of raw salad. Playing on similar notes with carpaccio and tartare, this dish is much beloved by the Hawaiians. The version here has cubed blue fin tuna mingling with seaweed, lettuce, shallot and more in robust spicy citrus dressing. The aroma of sesame oil is also present. A desirable factor lies in the crunch of the seaweed with the firm chunks of tuna. There is even an octopus version of this. I would gladly savor this poke salad anytime! There is only one requirement to sashimi and that is freshness. Our gorgeous platter of sashimi moriawase was a rainbow of blue fin tuna, salmon, scallops, octopus and Spanish mackerel. The oceanic selection was affectionately fresh and sweet with scallops taking first place in my books. Again freshness is crucial and this one is no difference from the sashimi. Chef’s choice of finger sushi has a good balance of fish ratio to the vinegared rice. Almost everything melts-in-the-mouth except the octopus which requires more bite. Traditionally authentic, it also proves that Doraku can be as authentic as it gets in certain dishes. Signature rolls with creativity in ingredients and name takes the cake on Doraku’s menu! Our favorite of the lot is Emperor Roll, a lavish one filled with salmon, tuna, scallop, crab and avocado, is decadently rolled up with seaweed, lightly battered and deep fried till just crispy on the outside. The huge cut rolls are served on a bed of fried sweet onions and greens with dollops of aioli, spicy sauce and tobiko. It’s really pretty at sight. Rice-free, it also makes one enjoy this without the carbohydrate guilt. You get sweetness from the seafood with a creamy spicy note and a lovely crispy finish for this one… superb! House signature, Doraku Roll consists of crab and avocado roll dressed with sliced tuna. The roll is crowned with a fresh mix of thinly shredded daikon radish, shiso leaves and golden crispy garlic bits with a citrusy Wasabi Yuzu Citrus sauce. You get freshness from each bite from the daikon mix with garlic ending contrasting with the lemony soy sauce. I knew I was going to enjoy this when I set my eyes on it. Though more familiar in ingredients, the California roll base is topped with salmon and Japanese aioli before being baked to a creamy goodness. Splashes of spicy creamy sauce and eel sauce dressed the roll before being crowned with scallions and tobiko. The dreamy roll is lusciously rich and decadent with a light spicy taste. One gets a chock full of sweet crab, tempura prawn and soft salmon, rendering a sea of flavors in each cut roll. Another must-order as this medley worked so harmoniously! A little surprise at this dish as it seemed to lean towards comfort food compared to the rest of the more trendy dishes. Rendered after Okinawan stir fry dish that usually consists of bean curd with other ingredients, this mix consisted of bean curd, sliced bittergourd, egg and sliced Australian sirloin. The hodge-podge of ingredients summed up a mellow savory note with an edge of bitterness from the bittergourd. Best savored with a bowl of rice, you’ll either love this or not depending on whether you like bittergourd. Basically garlic fried rice, it was good but lacked the essential breath of wok. Still commendable for a good dose of garlicky flavors in the fluffy short-grain rice… if you must have your fried rice! Everyone raved on the glorious hunk of beef ribs that day! The gargantuan ribs were inspired from Western BBQ and twisted with a Japanese flavor. Marinated in Japanese seasoning, the ribs were then slowly cooked and laced with BBQ sauce and served with sides of fried onion straws and coleslaw. It was so tender, I really didn’t need a knife to cut into the meat. For the ultimate experience, chuck away the cutlery and dive in with your fingers for that finger-licking goodness of tangy and sweet caramelized BBQ sauce on the soft silky strands of the meat. Carnivores… three ribs may not be enough because it’s that good! This one certainly live up to our expectation in the holy grail of burgers! Immortalized by Japanese seasoning, the wafu burger is one sumptuous burger you don’t want to miss. 150gm of beefy goodness, the thick patty was juicy, sweet and filled with loads of umami notes. The jewel of the dish was the perfectly fried egg with barely cooked egg yolk and Japanese aioli on it. As the yolk flows onto the patty, it coats the beef into a sinful luscious meat like no other. Yes, it’s sloppy and super moist from all the juices and egg yolk with mayo but it’s a worthy messiness to indulge on. This awesomeness comes with toasted sesame seed bun, fried sweet potato chips and coleslaw. Oishii! Traditionalist and always guarantees satisfaction when it has the tinged of bittersweet green tea essense as an after taste. I can never say no to this! Doraku certainly has quite a few hidden surprises in their menu. Chef Yutaro’s creations are mesmerizing in sight and taste and will certainly have you hooked for more. It’s simply Japanese dishes brought forward to our modern era with a few Latin and Asian twist. If you’re looking for a place to enjoy a great Japanese meal or hangout for drinks when you’re in the city, Doraku might be what you are looking for. It’s got a great combination of modern upbeat ambience, unique dishes and drinks to make your dining experience memorable! Marshall’s Burger, Jalan Burma @ Penang: Did Marshall Found His Perfect Burger in Penang? It was Perfect for Him! Yes, I did watch that episode where the unemployed Marshall went in search for his perfect burger which is ultimately how this burger joint gets it’s name and inspiration. When my nephew told me that Penang has just welcomed a Marshall’s Burger joint, I had to get a taste of it. 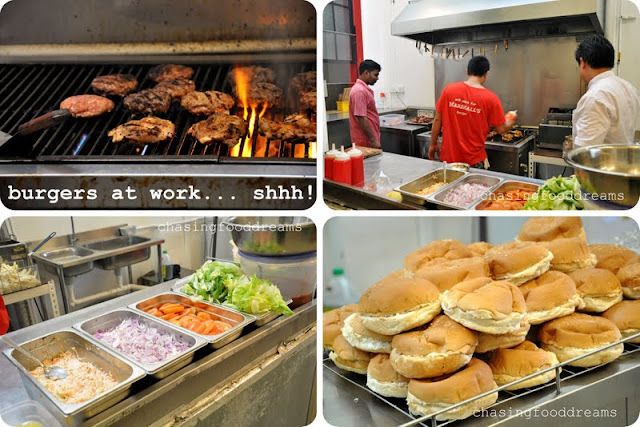 Previously made famous from a small roadside stall in Pulau Tikus, the popularity of the burger had the owner relocated into a bigger premise as lines were just queuing up too long at the roadside each night. No dragging required but pre-warned that we must arrive exactly at the opening dot of 5pm to avoid a massive queue, we took the advice and carried out our mission. Upon arrival, the burger joint was easily spotted with its location on the main Burma Road, next to Fima Supermarket. Entering the joint in excitement at 5pm sharp, we were already the four in line at the self-service ordering counter. Yep, place and pay your orders before you seat or vice versa as the joint is fairly small with limited tables and chairs. Marshall’s featured simple but clear décor, with chalkboards all over featuring its easy to comprehend menu. Basically, Marshall’s burger list consisted of 100% chicken, pork and beef in various concoctions. Add-ons are available to pump up the burger while sides of fries and onion rings with a short list of can drinks makes it simple and easy for ordering. Of course, there are a few posters of Marshall’s burger to temp your ordering into frenzy! My adorable nephew (resembling the boy from UP!, don’t you think so?) logged in his order for The Bull (RM9.90). A beef patty, a bacon and 2 cheddars summed up The Bull. As one can see, the patty is made thick so one gets the beef and not just the bun and sides. If you don’t specify the sidekicks, you get the normal of lettuce, onion and tomato with Marshall’s special secret sauce. The verdict? I stole a bite and was awarded with much juiciness of beef. Very flavorful in all corners of senses, I do admit the special sauce help with its sweet tomato and chili sauce goodness. Everything worked well except for the bun. It was a tad dry and some parts were soggy from the drench of the sauce but all is forgiven when the patty was so good! If you’re a carnivore or a chauvinist, I’d suggest you go for The Bison (RM15.90), a level up The Bull with 2 beef patties, 2 bacon slices and 2 cheddars. I, on the other hand, simply could not resist swine in any form. I took on The Hawaiian Piggy (RM11.90) with extra bacon (of course!!). The towering hog was indeed hard to bite into as I tried so hard at first bite. My nephew had much amusement in enjoying my feat in conquering this burger at the first bite!! The Hawaiian Piggy denotes its name with the famous pineapple and so, it was without a doubt that this burger had grilled pineapple stacked among a pork ham, cheddar cheese and a thick pork patty. Present as usual were the vegetables and the special sauce. All I can say is lustful! The pork patty was lustful. Thick, juicy, and bursting with loads of umami notes, the pork patty sang beautifully with the sweet pineapple, salty ham and bacon and creamy cheese. The medley of sweet, salty, spicy and tangy hit all the right notes with my senses. It’s messy and probably filled with tons of calories but hey, if you want less calories, have a salad. Me, I am just extremely pleased with the calories here… again, the bun is forgiven. An order of Fries (RM5) seemed to be a no-brainer and Marshall’s is a thick-cut steak fries nicely fried up and smothered in again, the Marshall’s special sauce. Messy seemed to be the must-have here so just diggin and enjoy. Ok, some may say if you had have other famous burgers like Burgerlab, Burger Junkyard, Andes and many more, this may not live up in some ways. But hey, Marshall’s Burger does have scrumptious patties good in their own way to level up with other big guns. In addition, this one is in Penang while others are in the capital city. Competition? Nah. Other plus points for Marshall’s include an unbeatable price for its quality and the Marshall’s special sauce! 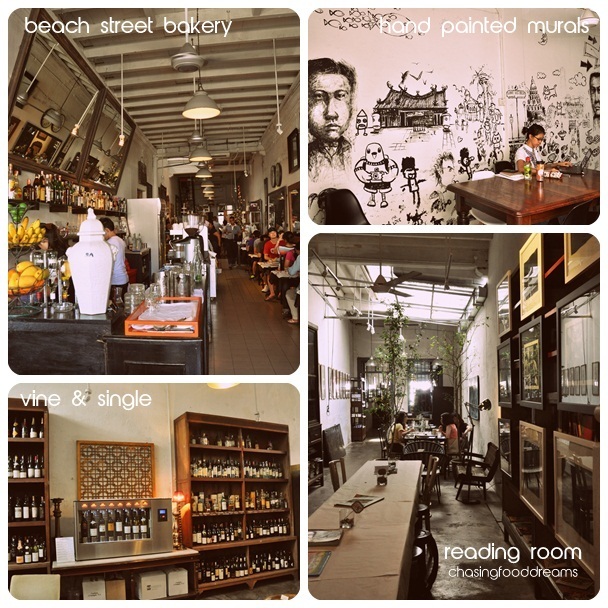 China House, Beach & Victoria Street @Penang: It May Be Old Soul but It has a New Life! Sometimes it’s Really Good to Revisit the Past! Life is strange at times. Most people will tell you to never to look back into the past. Then again, it’s the past that shape our lives. I like to say that revisiting the past can sometimes be a good thing once in a while. With the festive season almost over, I can finally settle down to blog about things dear to my passion. I have seen about this place in a few blogs. And yet, it still escapes my mind till last December when I was making a trip back to Penang. Once in a lifetime, some people are lucky enough to have one or maybe a few BFFs. Let me tell you a quick one about mine. J, my dear childhood BFF, and I are like day and night. If one ask how we both can be BFF, I‘d say day & night has to meet somewhere and somehow. And so, we bonded somewhere, somehow despite our huge differences. J has been with me through ups and downs, never physically by my side but always there in my heart and thoughts. We have shared so much through the years through many ups and downs and revisiting the past confirmed that this journey is what makes both of us so close to each other. We always make it a point to meet up each time when we can and since it was the festive Christmas season, J and her little one took me & my little one to China House. Located smacked in the Penang Unesco World Heritage zone, China House can be accessible from two entrances in Beach Street or Victoria Street in Penang. Well known among Penangites , China House was new to me though. If one were to ask me what China House is, I would reply, a bit of entertainment and chow in every possible way! According to their website here, China House comprises of 14 spaces from 3 heritage buildings of café, restaurant, bar, wine, gallery, multi-purpose performance theatre, shopping and more. It’s an endless experience of what one may seek depending on the time of your visit. You can read in details at their website. I’m sharing what was caught in my lens during a brunch visit there! Entering from Victoria Street, I walked through The Canteen & Bar where utter peace and not a soul were in sight. Immediately, the Canteen caught my eyes and lens with its eclectic mixed of furniture! From my research, the décor is the brainchild of Narelle and Alison, a dynamic team with an amazing knack to meld and bring old soul mish mash back to a new life! Filled with odds and ends, amazing enough, it felt very much like one beautiful masterpiece. 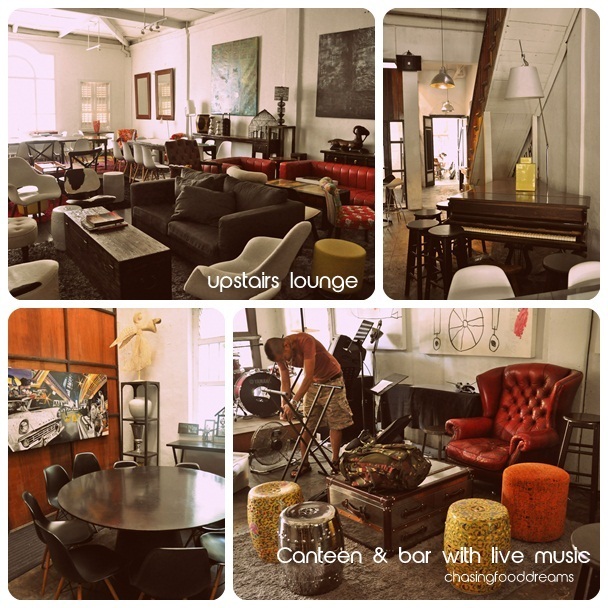 Arm chairs and stools, leather and cloth sofas, vintage trunks, wood and steel chairs, you name it, I believe they have it. An old grand piano fitted snugly into a corner, while the metal bar oozed with charm. Walls and ceiling are left in its origin with metal lamps hanging over. Another corner hosts the live band stage. Details of live entertainment are found here. Upstairs, open at night, hosted a large lounging area filled with more sofas, arm chairs and tables. Guest can play board games, pool, and more. Moving in, one passes a corridor that lead to the Courtyard where loads of sunshine glared between trees and shades. Walls are graffitied while steel chairs and tables are placed all over the area. A pond provides much needed water element and sound to the ambience. I also spied a few modern steel art pieces. 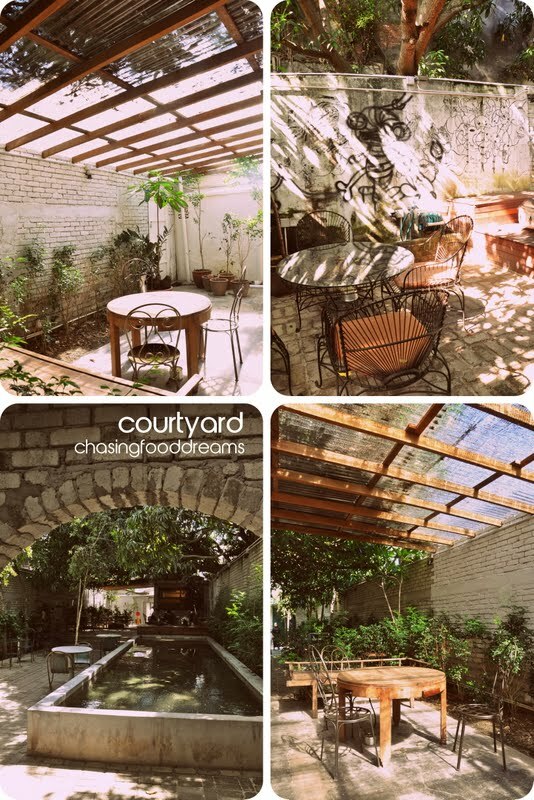 The courtyard is made for some warmness as one soaks in Mother Nature while savoring a selection of burgers and desserts. Heading through the long courtyard into the main dining area aptly named Kopi C. Espresso. Choose your seats from the long table with huge panel of books for reading or check out their private dining room or wine room. There is also the more relax main dining area of a nice cup of brew and another area for evening dining. Kopi C. serves breakfast from 9am, lunch from 12noon and dinner from 6pm to 10.30pm. At the Beach St. Bakery, one will just stand and drool over a long table weighted down with a sweet and savory haven of pastries, pies and desserts! A closed by chiller stock up iced cakes, ice creams and ice pops. Every piece looked utterly delectable, every piece inviting, begging to be savor. It was a hard decision in choice. All items are freshly baked from the kitchen and I could trail this back to the open kitchen at the courtyard where I spied the treats and its intoxicating aroma. 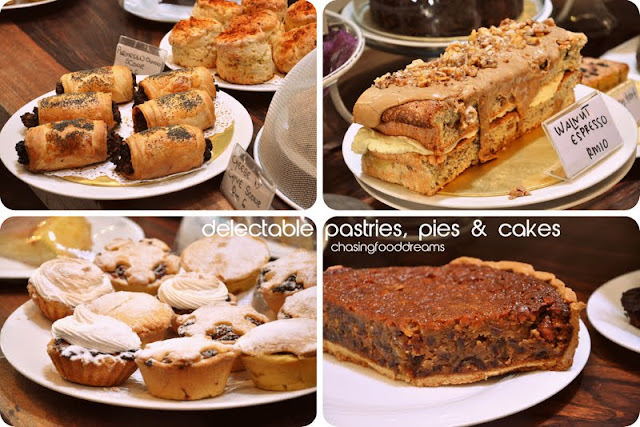 Be enticed by its list of cakes from Passion Fruit Butter Cake, Walnut Espresso, Tiramisu, Chocolate Raspberry Layer, Coconut Cake with Lime Curd, Assorted Cheesecakes, Salted Caramel & Apple Pie, Mince Pies, Date and Macadamia Tart, Bakewell Tart and so much more. Savory Chicken & Eggplant Pie, Beef & Guinness Pie, Quiches and Scones are also present for savory lovers. The list is endless and specials are also available during festive holidays. I always am a sucker for pineapple in any form I can get. Hence I ordered a refreshing Pineapple Mint Tea (RM10). As expected, fresh and tangy, the fruit juice was tainted with crushed mint and tea. Pretty refreshing! We shared a little of everything from Cheese Omelette (RM22), Chicken & Eggplant Pie (RM12) to Ginger Bud Pesto Spaghetti with Chicken Breast (RM30). High points go to the omelette with its perfectly cooked center with a glorious soft wobbly and cheesy goodness. The spaghetti is a myriad of flavors from it vivacious ginger torch aroma to the tinges of spices in the strands of al dente pasta. A little creamy, a little spicy, the herbs make this dish truly fusion in a beautiful way. Chicken was a tad dry though. The chicken pie had a good pastry crust but I thought the filling was a wee bit too minced up. We had to order dessert, in fact, we made sure to save room for it. Sharing a Passion Fruit Butter Cake (RM10) and Chocolate Berry Torte (RM10), I preferred the sour and tangy flavors of the Passion Fruit Butter Cake. Deliriously sweet, it more than made up as there was a good dose of sourness too. The cake is rich and quite dense and the icing is thickly layered on. The Chocolate Berry Torte was surprisingly not sweet at all but leans towards more on deep dark bitter flavors from cocoa. In fact, we felt that the chef might have forgotten to add sugar to this one as we could not taste any sweetness at all. Bits of berries are studded in the torte while a layer of thick ganache crowned it. I would love to go back to try their Tiramisu and Walnut Espresso. China House is full of life, old & new! 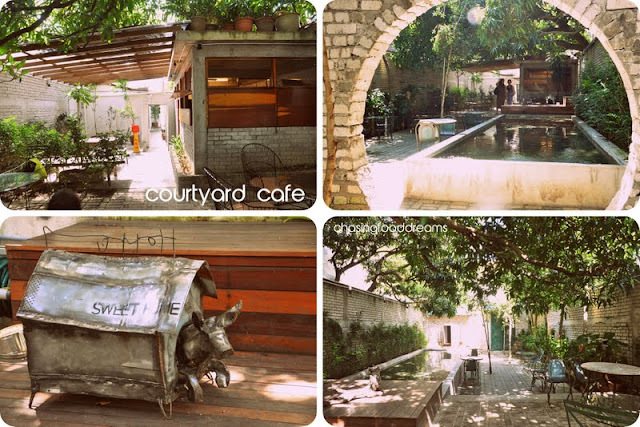 From its old eclectic décor to its modern food and brew, the charm is certainly there. One is literally transported into another world upon entrance and there is just a little love for everyone. From its graffitied walls, to the collection of antiques, art, food & drinks, live entertainment to the staff there trying to please its customers, the appeal to return is strong. Parking may be a nuisance in some ways but it’s worth the effort. For what China House is worth, I’d say it’s a great place to visit when one is in Penang. There are simply some things in life that is worth paying for… I’ll be back for sure! Upon my departure at the Victoria street entrance, I spied a quaint row of old shoplots and one particular door caught my attention with its sign. Sekeping Victoria, wouldn’t you be curious at this name? Peeking into the door unashamedly, I saw large open spaces with a row of bicycles. Consisting of two buildings, the minimal furniture space had a clean and crisp element. Curious and more curious, I found out that Sekeping Victoria is part of the sekeping family of retreats. The retreat is up for rent for any personal or business functions and is also a popular choice for weddings, exhibitions, photograph shoots and more. Its literally an open spaced warehouse concept with suite rooms and other facilities. More details available at their website here.